I am a huge fantasy and magical realism fan. I often find those special novels and think to myself, Is this author Pagan? Usually, the question goes unanswered, but sometimes I find out the answer is a resounding no. 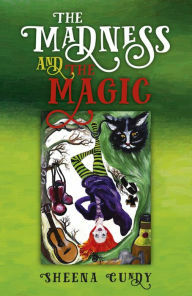 Well, with The Madness and the Magic there is no need to wonder, for here is a novel that is written by a Pagan and has full-on Witches as characters. Yea! I can totally picture Minerva, our menopausal protagonist, in my head, not only as herself, but as one or two Witches I know in real life. I can pretty much conjure Pagan Pride Day attendees in my head, she is so well realized. That’s a little scary, but also funny. The Madness and the Magic centers on Minerva, her daughter, Rhiannon, and Minerva’s friend, Isis, whom she’s taken under her wing, all in a small town, which just happens to have a new vicar. This is a British novel. I mention this as a point in fact; there is nothing that detracts for an American reader, but some people may be surprised by this if they do not read much British fiction. I like to picture towns and townspeople that are much different from my own Los Angeles suburb, which this novel definitely provides. The Madness and the Magic has the perfect amount of otherworldliness to it. Tarot readings, visitations from a god — a spirit guide (– something else?) lend this novel a fun and serious note to compete alongside those things in the book that are fully of this world, like unintended pregnancy and wondering what life is all about. I recommend this novel, but be prepared for not wanting it to end, for it comes all too soon! I recently read on Sheena Cundy’s Facebook page that she has a sequel in the works. That is great news, because who wouldn’t want more lifelike and magical representations of witchy women? I know I do!